The year 2018 was a year with a number of highlights and a number of disappointments. Early in the year the last WEF on Meiringen was successfully attended in Switzerland. Frisian Flag and the EART were also visited, where air to air photos were taken for the first time. This was a successful milestone which was achieved this year. The NATO Tiger Meet in Poland was disappointing, it was a difficult trip for creative photos. The highlight of 2018 was the APROC where many helicopters were captured in the landing zone. The 100-year airshows of Fairford and Radom were quite disappointing. The exercise Falcon Autumn was a very successful finish of the year 2018. In peacetime, the Swiss Air Force is currently not on stand-by 24 hours a day due to a limited budget reasons. From 2020 on, however, this will be the case, because from that moment there will be two F/A-18 Hornets stand-by 24 hours a day. The extensive air surveillance network is already for years 24 hours a day online. The Swiss airspace control and anti-aircraft operations are been carried out by THALES Raytheon FLORAKO. This system is operated from locations on the Pilatus, Scopi, Weisshorn and Weissfluh mountains. During the WEF it is common in Switzerland that one airfield will host the increased operating activities in this period. The responsible airfield for these actions will rotate annually. During this year’s event Meiringen in Luzerne will fly the CAP missions. There are 24 hours a day fighters ready to respond to an alarm. The World Economic Forum (WEF) is an annual meeting of the CEOs of the largest companies in the world. The forum participants are politicians such as presidents, prime ministers and other politicians, intellectuals and journalists. During the World Economic Forum two fighter planes from Meiringen are continuously in the air for a CAP mission. These aircraft usually consist of two F/A-18C Hornets which are all armed with live weapons like air to air missiles. Also in the darkness the F/A-18’s are used to fly these CAP missions until maximum 10 pm. The F/A-18s which fly CAP missions armed with live weapons under the wings. These weapons consist of two AIM-120 AMRAAM missiles at the intake suspension points and two AIM-9 Sidewinder missiles on the wingtips. At the Leeuwarden Air Base, the annual Frisian Flag 2018 exercise took place from April 9, until April 20, 2018. During two weeks, a mix of air to air and air to ground war scenarios were carried out by the participants of the exercise. The exercise took place in an international context of different NATO countries. The Dutch no 322 TACTESS (TACtical Training Evaluation and Standardization Squadron) will organise this year's exercise. The main task of this F-16 unit is to standardize the Dutch operational F-16 tactics and doctrines. When the European Air Transport Command was established in 2004, it could not be foreseen that a cooperation between countries of such a large size as now would arise. Also when it comes to air to air refueling, the European countries have joined forces by intensively training together during the annual EART. The EART is the most important training in Europe when it comes to practicing air to air refueling in a European joint venture. Standardization and harmony between the participants remains the main focus of the training. Due to the changing conditions in the world it is necessary to have a well-functioning and modern tanker fleet. The hotspots in the world are increasingly diverse and further away compared to the past, making a strategic tanker fleet an important factor for success. During the EART all aspects of refueling are trained. The EART was created to optimally use the existing fleet of tankers. In exercises such as Frisian Flag the emphasis is often on the fighter crews and not on that of the tankers. During the EART training this is excactly the other way around. The lessons which are learned during the EART have made politicians in Europe decide to join forces when it comes to air to air refueling with strategic tankers. With the help of the European Defense Agency, the study was started which led to the purchase of a joint European Airbus A330MRTT tanker fleet in the near future. In 2011 they started a project in the Netherlands where the idea arose to purchase a joint European tanker fleet. The idea of creating this joint European tanker fleet was developed by the EDA in the last seven years. For years, the NATO Tiger Meet has been one of the largest international military exercises in Europe. This year the edition of the NATO Tiger Meet took place in Poland at the 31st tactical air base Poznań-Krzesiny in the middle of the country. The NATO Tiger Meet 2018 (NTM2018) took place between May 14 and May 25. During this large scale exercise with a high international reputation, a media day was organized on May, 18. Media were given the opportunity to experience up close the operations carried out by the Tiger squadrons. The NATO Tiger Meet is one of the largest military exercises which takes place annually in Europe. Every year the European Tiger units send their aircraft to the Tiger Meet to train intensively together. During the Tiger Meet 2018 in Poland, various CAMAO war scenarios were flown which imitate contemporary reality of war. Also this year in Poland this year’s the Tiger Meet was held with the aim to promote European cooperation. The units which participated in the NATO Tiger Meet 2018 came to the exercise from all corners of Europe. Besides the intensive training, the NATO Tiger Meet also concerns the social aspects of the annual meeting. It is the intention that during the Tiger Meet the audience and the participating units come closer to each other. For this reason, a spotter day was organized on May 18, and the Poznan Airshow was held on May 19 and 20. During the Tiger Meet, the Tiger Games are traditionally held every year. The Tiger Games are a number of innocent games where the crews of all countries compete against each other to win ultimatly the Silver Tiger. The largest helicopter base of the Polish Army which is part of the 1.BLWL is 56 Baza Lotnicza (56.BLot) Inowroclaw. This air base of the Polish army is located about 10 kilometers northwest of the city of Inowroclaw in middle Poland. The base is equipped with utility and attack helicopters for offensive tasks. The Polish flying branch of the Army is referred to as the Lotnictwo Wojsk Ladowych (Army Aviation). The Polish Army has two brigades with different types of helicopters in active service. The helicopters have a supporting role in the Army. The Lubuskie Military Museum (Lubuskie Muzeum Wojskowe) is located in the town of Drzonów in the west of Poland, southwest of the city of Poznan. The museum originated from the Lubuska Land Museum in Zielona Gora in the same area. Since 1978 the museum has been restored and in 1985 it was officially opened to public. The museum contains an exhibition of old military aircraft and helicopters from the history of the Polish Air Force. The airplanes, helicopters and some armored vehicles are displayed outside on a fairly large area. At the Gilze-Rijen Air Base, the international course APROC 2018 took place from May 21 2018 until June 6 2018. The purpose of this course is to train and qualify helicopter pilots and extraction troops in Personnel Recovery. During this training course the crews will train in different areas in the Netherlands and Belgium. The APROC (Air-centric Personnel Recovery Operatives Course) is a course where reasonably young pilots with no or less experience are qualified to save people from behind the enemy lines with the help of helicopters. History shows that personnel who become isolated in an enemy environment can have a major impact on the home front and on politics of a country. There are many examples from the past where people have fallen into the wrong hands. The European Personnel Recovery Center was established through these bad examples. Within the NATO, guidelines have been drawn up which determine the risk of isolation. This guideline is indicated as the SERE (Survive, Evade, Resist, Extract) guideline and will help soldiers to survive in the field. During the APROC, military personnel from different disciplines such as fighter pilots, helicopter pilots and soldiers from the extraction forces will work closely together. The APROC course starts with simple scenarios and will build up through the course to complex scenarios where cooperation is a crucial element for success. The EPRC was created to assist the countries of the European Union and NATO in educating and training military personnel who are able to retrieve their personnel from isolation in several hostile territories. Since the EPRC organization began the training of Personnel Recovery in 2007, a lot has changed. The organization has grown over the years into a mature organization. The countries participating in the APROC no longer depend on third parties such as the United States for these types of PR missions. Every day, three Task Forces go on mission from Gilze-Rijen. There are three directions where helicopters can practice. These areas consist of a north-eastern zone, a south-eastern zone and a south-western zone which is located in Belgium. After the fall of the Berlin wall and the suspension of conscription, the entire Dutch defense organization was changed. In 1993, the 11 Bevocie moved from the 11 Armored Infantry Brigade to the 11 Airmobile Brigade which was new in the Army. The actual conversion was in 1995, when the unit moved to Schaarsbergen near Deelen Air Base at the Veluwe. The motto of the 11 Bevocie is " Laborandum Est" or "We will work". The slogan "Bevo SEAL!" Is often used by the unit, where SEAL stands for Special Elite Armed Logistics. The Royal Air Force (RAF) are the air forces of the United Kingdom. This military branch was founded at the end of the First World War on April 1, 1918. This makes the RAF the oldest independent air force in the world. This year, during the RIAT at RAF Fairford, the 100th anniversary of the Royal Air Force was be celebrated. Although the British were not the first to use military aircraft heavier than air, the RAF is still the oldest independent air force in the world. The RAF was the first air force to become independent from the army or navy. During the Second World War, the decisiveness and dedication of the Royal Air Force would play a major role during the many combat missions. At the beginning of the war, it quickly became clear that without decent aircraft the war was lost. The British were forced to drastically increase the development of new aircraft. The RAF underwent a rapid expansion after the outbreak of the Second World War against Germany in 1939. This expansion consisted of the training of British aircrews in the British Commonwealth countries. Shortly after the Second World War, there a turbulent period took place for Europe and therefore also for the RAF. Europe was slowly rebuilt and the geopolitical situations were shifted in the world. Eventually, the RAF, as NATO ally with the Western European countries, would enter the Cold War against the Soviet Union and the Warschau Pact. After the victory in the Second World War, the RAF had to be reorganized further to be ready for the future. Technological progress was continued with the arrival of jet fighters and jet bombers. After the fall of the Berlin Wall, much would change in Europe and therefore also for the RAF. European countries that were considered hostile became now European allies. The power balance of the Cold War period was gone. A new era would dawn for the European countries and the war against terror would start. The RAF is still an important partner of many countries around the world today. The organization of the current RAF is nowadays compact, modern, fast and flexible deployable around the world with its NATO partners. The vision for the future of the Royal Air Force runs parallel with the support of current British military operations in the entire world. For the future, fighter aircraft of the fifth generation will be introduced at the RAF. There is increasing focus on network-enabled options and greater interoperability with NATO members. The current RAF is a lot more compact than the organization has ever been in its rich history. The focus has shifted over the years from a large air force to a smaller and very mobile air force which can be deployed anywhere. The aviation museum in the city of Krakow is one of the largest aviation related museums in Poland. The museum was founded in 1964 by the Krakow Aero Club. The museum covers a small part of the area, and part of the buildings, of the former military airfield Rakowice-Czyżyny just outside Krakow. In the museum people can find aircraft from the entire history of the Polish aviation. In view of the collection, the emphasis is mainly on military aviation in Poland. Especially the aircraft from the Cold War period are well present. In the year 1918 in the months after the end of First World War, Poland would for the first time in history become an independent and republic. After an early start the Polish Air Force aircraft received the characteristic red and white chessboard symbols on the fuselage and wings. Shortly before the Second World War, the Polish Aviation Industry would excel. The Polish Air Force is referred in Polish to as Sily Powietrzne which literally means air force. The Air Force of Poland is one of the military branches of the Polish armed forces. During the Second World War, Poland was one of the first countries which was attacked by the German armies. Many air force troops managed to escape to France and England. The Poles who struggled with the Germans there, would gain much fame during the Second World War because of their excellent skills. The air victories that the Kosciuszko Squadron made during the biggest air war of all time were spectacular. The no 303 Kosciuszko Squadron would once again immortalize itself in Polish history books with this contribution. One of the highlight days of the Polish aviation industry and the Polish Air Force was the period of the Cold War. Poland was an important ally of the Soviet Union and would build many aircraft for the European partners of the Soviet Union in Poland. The Polish Air Force was also gigantic during this Cold War period. The Polish People's Army Aviation was founded in 1943 by Polish patriots who wanted to liberate their country from Germany. This army was launched in cooperation with the Soviet Union and soon this army also got its own air force. After the fall of the Soviet Union and the end of communism in Europe, Poland and especially the industry would have a hard time. The country was virtually bankrupt, and eventually the aviation industry would not survive this major blow. The Air Force entered a new era when Poland became a member of NATO in 1999. After the fall of the Soviet Union in 1989 and the disarmament in Europe, the Polish Air Force was reduced drastically. The Polish Air Force had at that time a lot of aircraft. Many bases were closed after the fall of Communism. The Polish Army Museum is a well-known museum facility that collects, develops and exhibits military and historical exhibitions with a relation to the Polish Armed Forces. The Polish Army Museum is located in the middle of the busy center of the Polish capital Warsaw and was founded on April 22, 1920. The aircraft and helicopters in this museum are permanently displayed on the grounds of the terrain. Besides the aircraft and helicopters, there is much more to see in this museum. The aircraft are of excellent quality and are well maintained. The Muzeum Katynski is a museum which is related to the Polish Army Museum which can also be found in the city of Warsaw. The museum can be found on the inside terrain of Fort Sadyba. In the Katynski museum, twenty Polish planes and helicopters are set up on the inside of the fortress area. The condition of the aircraft in this museum is not the best quality. The aircraft are often covered on the nose sections with covers which are probably never removed after the installation of the aircraft. The aircraft are very poorly maintained. From September 26 until October 13, the integration exercise Falcon Autumn 2018 took place. Airmobile units from Germany and the Netherlands participated in this exercise. 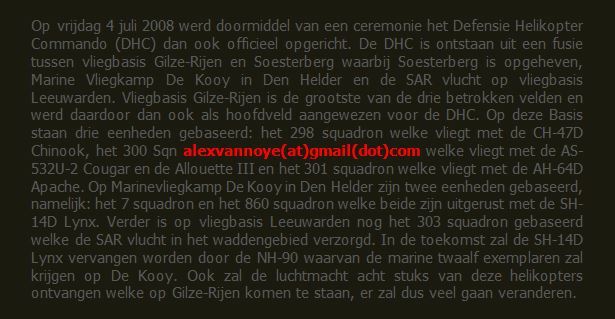 The helicopter flew daily from Deelen Air Base. The exercise was held in the Veluwe area, in the east of the country and the north of the country. The Netherlands is a country which has been involved Air Mobile operations for more than 25 years. During Falcon Autumn 2018, all aspects which make an integrated airmobile landing a success are extensively trained. A few years ago the Dutch and German defense ministers signed an agreement stating that the ground components of the German and Dutch airborne troops would be merged to one combined airborne division. During Falcon Autumn 2018, all airborne components from both countries came together in a large exercise. The 11th Airmobile Brigade (11 LMB) has become part of the German "Division Schnelle Krafte" (Division Rapid Forces). It is unique in Europe that a unit such as the 11 LMB is under the command of another European country. The year 2018 was not really a year in which a lot was photographed at Eindhoven Air Base. Therefore it wasn’t the most exciting year. Nevertheless, some nice visitors were captured at this airbase. In February, a Greek C-130 Hercules came along, which was captured on the runway at the Wintelre side of the base. Shortly after this Hercules a Spanish Citation came along. The Hungarian An-26 was also a very nice visitor. At the end of the year, an An-124 came on deck since a long time. This Antonov arrived at Mil East in the dark.